Facebook Book Page: "Through Innocent Eyes - The Chosen Girls of the Hitler Youth" and "Through Innocent Eyes - The Chosen Girls of the Hitler Youth Book Discussion Page"
Ms. Sandor understands media, print, online, television, and radio. For over ten years, she was the Manager of Copyrights, Licensing, and Administration with John Denver’s Music Publishing Company. She has appeared on the Sid Bernstein Show, Dolf De Roos, Cornerstone Cancer Center, and the Deanna Spingola Radio Show. 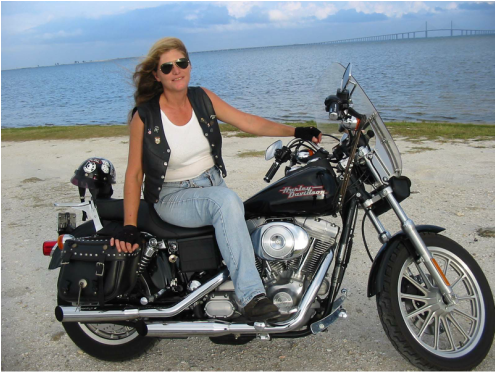 For three years she produced and hosted The Lady Rider Television Show, Business Forum and Adventures with Cindy, on Pinellas County Public Access TV in Clearwater, Florida. She has written for Guitar for the Practicing Musician, Biker Ally Magazine, and the Tampa Bay New Times Magazine. Her story “Europe to New York City on the United States – July 6, 1957” is contained in the 50th Anniversary Maiden Voyage Edition – S.S. United States: Fastest Ship in the World by Frank Braynard and Robert Hudson Westover, published by Turner Publishing Company. Her website has received over 11k hits since the launching of her book. For the past twenty-five years, Ms. Sandor has called the Tampa Bay area her home. She is a member of the Palm Harbor Toastmasters Club #8248, the Oldsmar Women’s Club, and a member of Aspiring Writers, Publishing & Marketing Meet-up Group in Tampa, Fl. In addition to speaking at various schools and libraries, she speaks at various military re-enactments events including D-Day Conneaut, Ohio, Bivouac & Barracks – Zephyrhills Airport Museum, Dade Battlefield Historic State Park, 1st Florida Chapter Military Vehicles Preservation Association, Road to Victory Military Event and Show. Upcoming speaking engagements can be found on the "Events" tab above. Ms. Sandor holds a Bachelor Degree in Business with a minor in Human Development. In December 2012, Sandor launched her 436 page book “Through Innocent Eyes - The Chosen Girls of the Hitler Youth” which is now being acclaimed as the 'opposite of the Anne Frank Diary." Her biography is based upon her mother’s personal handwritten journal, declassified records, and personal interviews from the last four remaining survivors from Landjahr Lager (Country Service Camp) program. Ms. Sandor lives in Oldsmar, Florida with her two Chihuahuas.